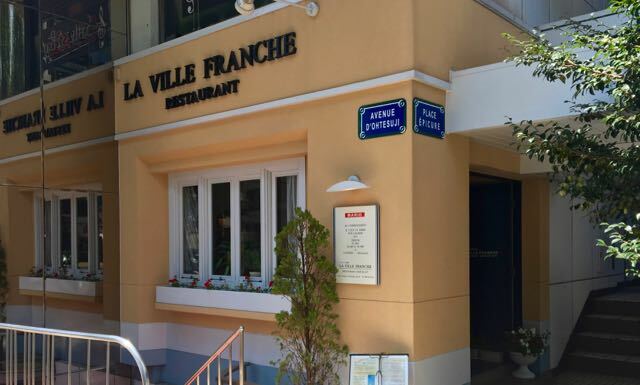 The restaurant Français “LA VILLE FRANCHE” on Otesuji in Kochi City stands out on the sometimes garish street by its quiet charm. The front is soft yellow and welcomes you warmly. Opening the green door, a beautiful, solemn but friendly atmosphere spreads before your eyes. Kazu and Shinichi Ogasawara are waiting with charming smiles. They might seem to be shy, but they are talkative actually. They make you feel comfortable during whole your time there with heart-warming hospitality. You can escape from the real life and feel like being in a traditional restaurant in France. Thirty-eight years have passed since the restaurant opened in 1977. At first, they had a restaurant near Harimayabashi (in front of the old SEIBU department store ) by the name of ‘マリオ (Mario)’. After 10 years, they moved to the present location and changed the name. But even now, people affectionately still call the restaurant Mario. In the early days, they used to be told that a specialized Western cuisine restaurant in Kochi was impossible. But Chef Ogasawara has always been his own man. …So thought Chef Ogasawara at the age of 21 when he was a university student. This idea had come to him after thinking deeply about how to live authentically. Such thinking and commitment has kept the restaurant thriving. After a few years of running the original restaurant, he knew he needed more expertise, not so much in cooking, which he could learn from books, but in the art of running a real French restaurant. After coming back to Japan, he opened new restaurant which has remained until today. The experiences they gained on the trip are expressed in the new restaurant. French cuisine has continues to be his way of life, and even now, he keeps learning new things. He remains fascinated by cooking French cuisine. He feels happy that he can continue his restaurant, because it’s the only remaining genuine French restaurant. While there are a few other restaurants that serve French food, their emphasis is on alcohol, not cuisine. Viewed from this perspective, Ogasawara’s restaurant is the last one of its kind in Kochi city. Still, he is an energetic and passionate person and enjoys interaction with regular customers. I think, without any experience and training, what he did is great because he learns himselfe and he discovered the real French food in Kochi. Every one must have learn from others but he he just followed his own way and provide French cuisines. This is a beautiful story. I often go to Obiyamachi and near Harimaya-bashi but I’ve never seen it. I really want to visit this restaurant and have awesome dishes which the amazing chef cooks! After I read this article, I felt like I could know new things what I didn’t know. And certainly, I’ve never seen French restaurant in Kochi before. This article makes me want to go there. Furthermore, there is a long history to do this restaurant now, it moved me a lot. Old things will just disappear…. This word makes me feel so sad too! I don’t really think that will disappear. It will stay there forever! People just forgets. Though I live in Kochi for a long time, I didn’t know this restaurant. I’m learning French so I’m interested in French restaurant. I hope I can go this restaurant some day. Maybe it’s only as the only French restaurant in Kochi. Maybe it will disappear just like other old things, but it already became a wonderful memory for many families. Life is adventure. I have to try new thing, I thought. maybe, I’ll go to there to honey moon …. some time. I didin’t know such as french restaurant in Kochi until now. I’m impressed that the woderful history to create new restaurant. I want to visit there and eat his dishes. It must be hard to continue seeking real France in Japan (actually Kochi), but this menu and the appearance of this restaurant look very fancy and make me want to drop off at. Unfortunately, I am not afford to enjoy these meals frequently. Therefore I note this place to stay on an anniversary day. It must be difficult to continue seeking high quality and the real france in Japan(abtually in Kochi), but the menu and the appearance of this restaurant look fancy and make me want to drop off at. Ungirtunately, I am not afford to stay here frequently, so I would like to note here as an anniversary spot.